There aren’t a ton of restrictions on the source materials you can use to make vodka. Distillers can use pretty much anything that can be broken down into fermentable sugar as the source for vodka, as long as it’s distilled to near neutrality. While the sky may be the limit for source materials, vodka is most commonly made from corn (Crystal Head), wheat (Absolut), grapes (Ciroc), rye (Belvedere), potatoes (Karlsson’s), and the ubiquitous “neutral grain” (Smirnoff) which can be almost any grain or mix of grains (including even soy). Whey isn’t a very common vodka source, although like any fermentable sugar it can be transformed into alcohol with the right kind of yeast. 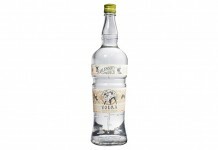 VDKA 6100 Vodka may not be the first vodka to use whey (that distinction goes to Vermont Spirit’s White Vodka), but it is the first real major international play for whey in the vodka category. VDKA 6100 is backed by Australian casino mogul James Packer and famous actor Robert De Niro. De Niro is quite an entrepreneur and has significant investments in Nobu Hospitality Group, Tribeca Grill, Locanda Verde, and the Tribeca Film Festival (which this year served as the launch event for VDKA 6100). He is known for taking an active role in his investments, which may help keep VDKA 6100 from being yet another celebrity spirit. VDKA 6100 Vodka, whose name feels like a riff on SVEDKA, is actually named for the Australian country code “6100” located right outside of Perth, which happens to be the location of one of James Packer’s major properties, Crown Metropol Perth. Although it has an Australian inspired name, the vodka itself comes from New Zealand, where the whey is sourced from grass-fed cow’s milk. VDKA 6100 Vodka (40 % ABV / 80 proof, $34.99) – before nosing this vodka, it’s clear that a lot of time and attention has been spent on the packaging. 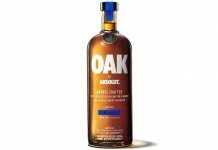 The bottle was designed by New York designer Joe Doucet and it does a good job of conveying that this vodka is “different”. The brand has decided not to push the fact that VDKA 6100 is distilled from whey (that fact is quietly mentioned in small type on the side of the bottle). On the nose, VDKA 6100 is light with lemon, vanilla, white flowers, and powdered sugar. The entry for VDKA 6100 follows on from the nose fairly well with light lemon and vanilla backed by black pepper. VDKA 6100’s entry is well complemented by a very soft and round mouth feel. Things transition a bit in the midpalate where the lemon intensifies and becomes more acidic. VDKA 6100 also gets a little spicier in the midpalate as black pepper spice intensifies and the sweeter vanilla and powdered sugar that were more of a lead note in the entry become more of an undertone. Towards the end of the midpalate, things become more acidic and we get the introduction of a little bit of heat. The mouth feel also transitions and we completely lose all of the soft and round qualities of the vodka which were established in the entry. The finish is fairly long but unfortunately unpleasantly acidic with a touch of mouth burn. Even after VDKA 6100 has finished on the palate there’s a lingering unpleasant acidic quality left in the system. 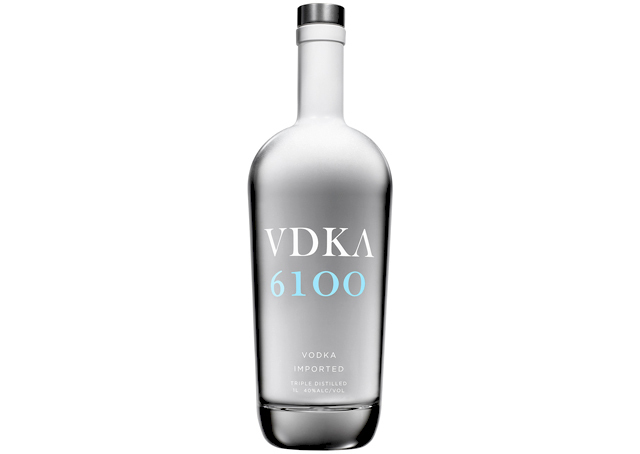 VDKA 6100 Vodka has a consistent taste experience with the Vermont Spirit’s whey-based vodka: a smooth and enjoyable opening and mouth feel, but harsh and acidic finish. This discordant taste experience calls into question how good a choice whey is as a source material. While whey inherently has a nice roundness to it with an undercurrent of sweet, it also often has an unpleasantly harsh finish. VDKA 6100 is hampered by this finish which is just too acidic to be enjoyable. VDKA 6100 is priced around $35 which is right in the neighborhood of another celebrity spirit, Ciroc (clearly used as a reference point for this release). Without the promotional strength of James Packer and Robert De Niro, VDKA 6100 would probably just exist in the marketplace as another small niche spirit, but these two have the ability to place the spirit in enough hotels and restaurants to prevent that. 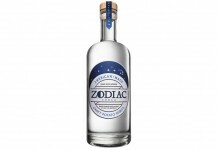 The idea of using New Zealand spring water in a vodka is a great one, as the Stoli Elit Vodka Pristine Water Series, New Zealand Edition showed so well, but using whey clearly wasn’t such a wonderful idea. VDKA 6100 could have done much better following its countryman 42 Below’s path, combining wheat with that fantastic water.